Alone in the Storm (hereafter AitS) is an expansion that offers an intense and new gaming experience for novel and veteran players of the War Storm Series (hereafter WSS) titles. AitS enables you to play a solitaire mode or a semi-cooperative up to 4 players by combining this expansion with the game you want to play. All the scenarios included in the base games may be played solo or with a comrade in both sides, and it includes a scenario generator to play any scenario using a point-based system. AitS seamlessly integrates with all the titles of the saga; with those already published and for those to come in the near future, since it uses the same set of standard rules of the War Storm Series. This backwards compatibility is thanks to a set of specific charts included for each game. A set of rules to play a solitaire mode of any the WSS games. A set of rules to play a cooperative mode, 2 players vs AI. A set of rules to play a competitive mode, 2 vs 2. A Scenario Generator Tool to play a point-based system. Fog of War (hereafter FoW) rules that may be used with the standard rules and for the solitaire and cooperative mode. 436 counters and markers (5/8” and 3/4″9. The expansion includes 189 Intelligence markers, that are the core for the fog of war and the events in the solitaire mode, in addition to all the counters and markers needed to manage the AI and other game modes supported. Also, Victory, Morale and Experience markers are included that may be used with the base game. 3-4 Help Sheets and Charts that summarizes the main rules, allowing the player to have all the needed information at a glance. 4 compatibility sheets for Normandy, the Beginning of the End. 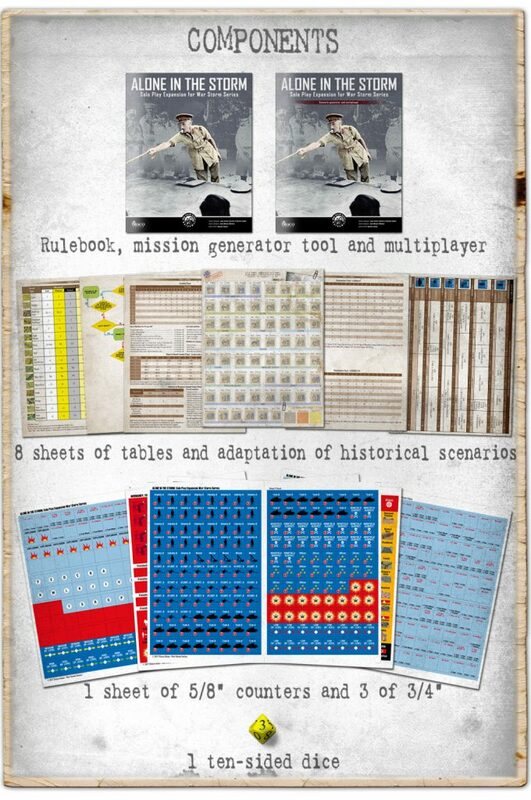 Among them, you may find Recruitment Charts, FoW Conversion Charts, Intelligence Markers Charts, HQ Chart and specific rules for historical scenarios included in the base game. 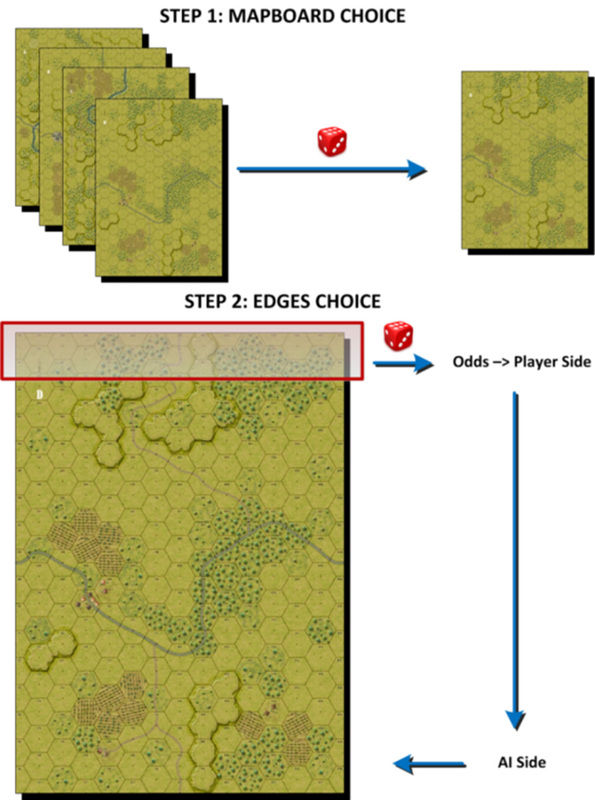 1 Solitaire Scenario Generator and rules for the semi-cooperative mode. Note: Compatibility sheets for the former WSS titles will be available online for download in PDF format once the game is released. The game sequence is similar to a standard game, thus seasoned players will find the system familiar since the control of the AI units it´s almost identical. However, to manage and command the AI units a new phase have been added, the HQ phase. Adapting a complex game system such WSS to be played solo is a tough endeavor since there are multiple in-game situations and a wide range of available options on each game. All this implies that the player´s side management becomes more difficult, above all at the beginning. Draco Ideas is aware that not all the players have the same tastes; some prefer a smoother gameplay and take some decisions on behalf the AI, while others believe that a full management of the AI is the best option in other to avoid playing both sides. To content both types of gamers, we have implemented a simplified model and a complete autonomous model, with 2 levels of difficulty so that the AI adapts to the player. How does the AI works? 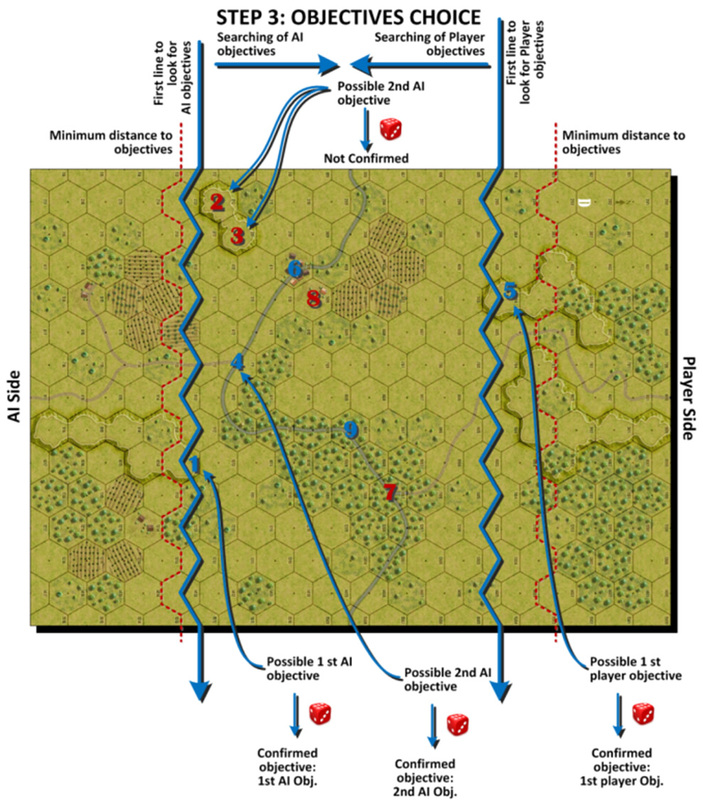 Developing the AI to control the non-player forces has been a challenge due to a game system that is based in the use of units comprised of several platoons that are under the command of an officer. This reality has made us to define several layers of control, allowing the AI to effectively simulate the chain of command. The AI side is managed by a general attitude that may be offensive (Rush) or defensive (Resistance), so that this stance is defined on a turn basis by taking into account several aspects: forces ratio; objectives under AI control; or the number of turns remaining to complete the scenario. By using this method, we define a high-level AI that will be either offensive or defensive. This attitude aims that all the companies get a common stance and, mainly, that they are coordinated. Hereafter, each company may have a different operational level that will set the priority in which they will be activated. Three operational levels are defined: high, medium and low. Depending on the rush or resistance attitude, different operational levels will be assigned. Companies with a higher operational level will be activated first, and for the player´s misfortune, it may be activated twice on the same turn! After this second layer in the AI management, we have the most difficult one to be executed: individual orders to each platoon in the company. This is achieved by using a flow-chart that will set the particular action to be performed. One of the most important characteristics in AitS is the FoW. This set of rules maintain the uncertainty over the enemy forces to which a player is facing, enabling an intense gaming experience. The player has a rough idea on the types of units that are on the board, but due to a set of random events, the course of the battle may change at any moment. Where you expect to face an infantry enemy platoon it could show up an armored platoon, or even nothing, a “decoy” formation. However, don´t worry too much. In most of the cases you will find what you expected on the reverse of an Intel marker. Intelligence Markers (Intel Markers) will come into play during the set-up. Throughout the battle, they will move and combat just like a regular platoon though they may not be attacked until they are properly identified! In the front, these markers depict a symbol that shows the type of formation you may expect in that location. On the reverse side, Intel Markers are divided into two parts: top area includes an event that may take place once the formation is recognized and located, while below shows a modifier that it´s applied when the player is attempting to locate and recognize the AI unit. This turns each marker into unique since the information displayed on each marker is different. In turn, this allow us to introduce a new concept into the game: random events, but you´ll see later on that they are not random at all. In the example above, the German Intel Markers are ready to stalk the American units. 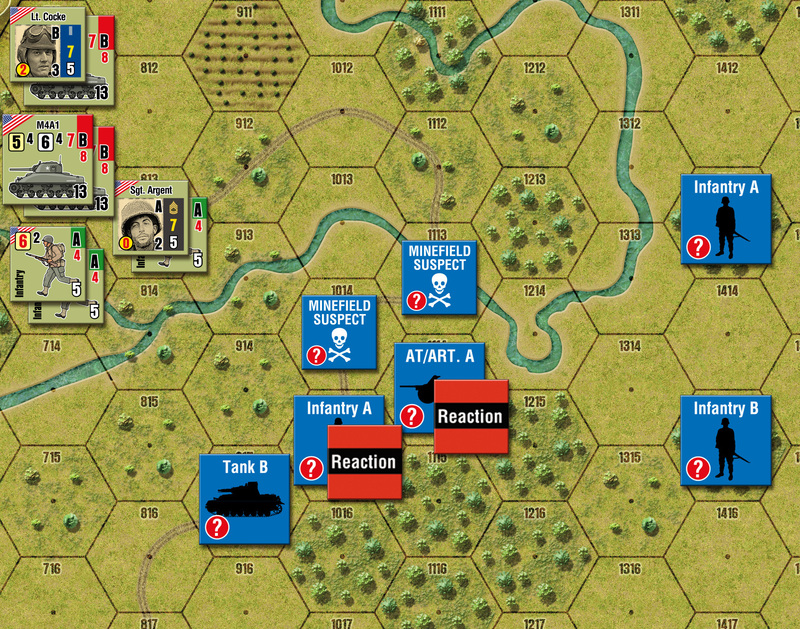 At this stage of the game, the American units have the line of sight blocked. 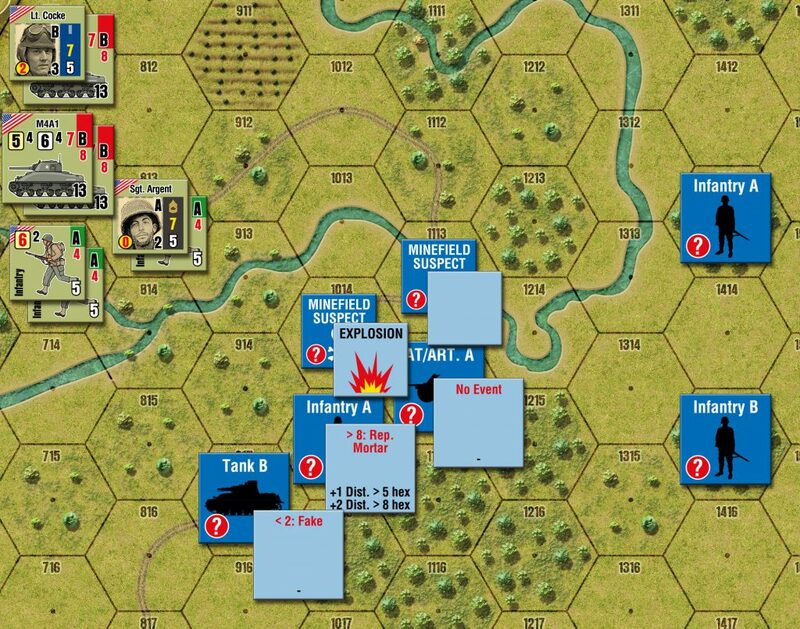 The player, who is in charge of the American units, has to decide whether to carry out a recce mission to find out what enemy units are waiting or to march forward and assume the casualties he may receive due to those units marked in reaction. If a recce mission is successful, an Intel Marker will be recognized and the marker will be flipped over. Then, the player will see what event is included in the marker. We have studied thoroughly all the events for all the markers, and generally, in 70-80% of the cases the real unit will match what you expected. Only in 20 to 30% of the markers will differ from what your expectations; in some situations you will find more than a single unit while in others you´ll find a different unit or even an empty space. This ratio is not applicable to the Suspected Minefield markers. At the beginning of the scenario, the probabilities are set to a 50%. But this FoW is not exclusive in the solitaire mode and may be used in a standard 2 player game. During the set-up, players may recruit Intel Markers and the events they wish. To do so, we have included log sheets in where the players will annotate what they have bought during the forces build-up. A player may get an Intel Marker which event will allow him to change the type of unit or even a decoy, to deceive the opponent. By using this method, the events become a non-random factor: you may plan in advance how to fool your opponent. AitS includes a scenario generator that uses a point-based system and enables the players to design their own scenarios to be played solo. However, this set of rules may be used also to create scenarios for a standard 2 player game. You may challenge the AI in a balanced scenario with the aim to seize more objectives than your enemy; or attack/defense scenarios in where the AI may act as the defender and the player as the attacker, or vice versa. 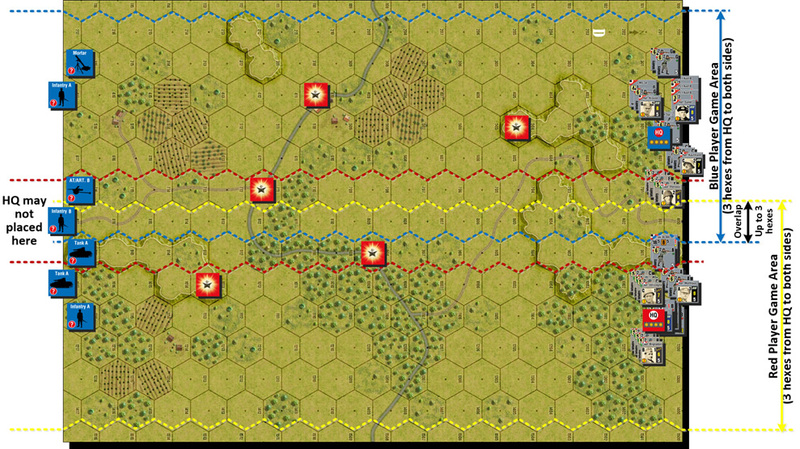 This scenario generator establishes the rules to determine what hexes will become objectives and the locations in where the AI units will be deployed. In this game mode, 2 players will try out the solitaire mode rules to defeat the AI, with all the depth and uncertainty that FoW brings up to the game. Each player will assume the role of a Battalion commander, and under his/her command there will be a given number of companies. This way, both players will have to balance between fight in close quarters with his comrade to defeat the AI, and how to deal with individual achievements, since only one of the players will be promoted to command the Regiment. In this game mode, both players will have at their disposal a Headquarters marker, that limits the movement capacity of their units, in such a way that a company´s player may not move into the area that the other player is in charge of and is under the control of his/her battalion. By using a log sheet, that will be available online in PDF format, both players will track their Victory Points, the defeated and lost companies, as well as the surviving units to tally the total points at the end of the game and determine what player, if any, is the winner against the AI. The competitive mode, in reality, is a variant of the cooperative mode. In this mode, a 2-player team will fight against another 2-player team. Neither you´ll have to learn the solitaire rules nor you´ll have to control the AI. However, the FoW rules will be in force and no random-events will take place. Instead, each player will annotate in their log sheets what markers are they going to get and what companies these markers will represent on the battlefield. In addition, for each marker the players will be able to “buy” an event and will keep this information hidden to the opponents. Once an Intel Marker is properly identified by one of the opponents, its owner will read aloud the event, in case he got it during the set-up and he will place the proper company counter on the map, according to what is annotated in his log-sheet (if it wasn´t a decoy). In this game mode each player will have at their disposal a Headquarter of his color and up to 15 officers’ counters. This is the way players can easily identify the owner of an Intel Marker during the game. A vast number of battlefields are ready, awaiting and you are alone. Dare you face the storm is about to come?